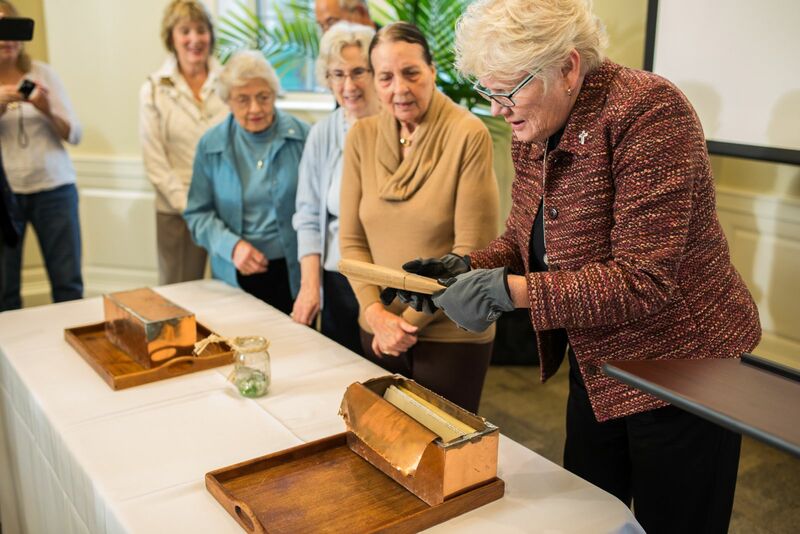 On Oct. 11, American University Washington College of Law (AUWCL) and the Office of the University Architect joined the Immaculata Alumnae Association for an event to open two time capsules found on the site of the future home of the Tenley Campus during recent construction. The event was co-presented by the law school, Sisters of Providence of Saint Mary-of-the-Woods, and the Yuma Study Center. 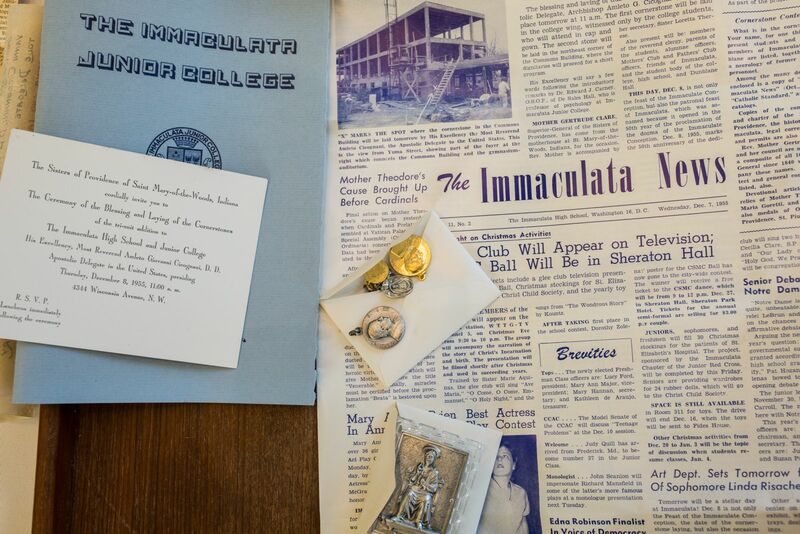 The time capsules, dating from 1955, were recovered from the cornerstones of the Immaculata Schools which once included Dunblane School, Imaculata Preparatory School, Immaculata High School, and Immaculata Junior College. The schools were largely located on what is now the Tenley Campus. The historical Immaculata Seminary and Dunblane structures on the Tenley Campus still stand, and are being incorporated into the design for the new law campus. Sister Lisa Stallings, vicar for Sisters of Providence of Saint Mary-of-the-Woods, provided the welcoming remarks. She explained that there are parallels between the Imaculata Schools and AUWCL—particularly that both were founded by women and both fostered justice through education. "Continuing to provide education on the grounds of Immaculata is continuing the mission of the Sisters of Providence and Immaculata…it is in a way handing off the baton," said Stallings. The ceremony included a presentation about the history of Tenleytown and the role that Immaculata and AU have played in its development. Virginia Richardson, university architect, and Billie Jo Kaufman, associate dean for library and information services at AUWCL, spoke about the future of the Tenley Campus as the new home of AUWCL. "The law school has had a number of homes but this campus will truly be something special,” said Kaufman. "The Order’s work in social justice, healthcare, education, peace, and justice will be continued on this campus and the remaining buildings." The time capsules were opened by Immaculata almnae, AU Construction Manager Frances Pan, and AUWCL Facilities Management Director Walter Labitzky. They revealed such items as a copy of the Immaculata News, the junior course of study for that year, lists of students and the Sisters in 1955, prayer cards, religious medals, and more. Learn MORE about the law school’s new home at Tenley.